It’s a significant fraction of the work force working in the private sector. But also, Raul Castro talks the talk – these are changes he values. So the alignment between the policy changes and what the top leader thinks for the first time in over a half century now clicks. That is a significant change. It’s difficult in the U.S. to grasp this because the changes are very slow. The government has insisted on authorizing activity-by-activity. So you can be a music teacher in the private sector, but you can’t be a math teacher in the private sector. You can play music in the private sector from the 1940s and 50s for tourists, but you can’t have a band in the private sector that performs contemporary music that Cuban teenagers like. So it really is category-by-category. The Cuban government is very proud that there are nearly 200 categories where private activities are authorized, but this way of doing it is madness. You can have someone who sews shirts and sells them, but you cannot bring a shirt from your cousin in Miami and sell that one. So there are those kinds of distinctions, and it’s very easy to imagine that nothing is happening, that everything is petty (and it’s true some of this is petty), but the general trend is toward opening. How has the regime endured so long? Is that because of this slow opening you’re talking about? I think the slow opening matters politically. It tells people things are changing in ways they can experience in their own lives. They can get a variety and quality of foods they couldn’t get before. They can now earn income with one of these self-employment licenses. Do you think Cubans have reason to fear that some of the more successful programs like education and healthcare, which has become part of Cuba’s economic backbone, would be weakened with privatization? Are they compatible with private enterprise? At some broad level, Cuba’s fairly successful education and healthcare systems will continue. The healthcare system is one likely source of exports for any Cuban in the future – it doesn’t matter what the political regime is or the name of the president. Cuba can export healthcare personnel to other countries. It can have medical tourism – they already have some of this. And if they were to do it on a more commercial basis it would actually earn a lot more than they do now. And no government would want to prevent the healthcare system from working well if the system can then pay for itself. Similarly, you could imagine [private practice] on the school side. Cubans have much, much better results on international tests in mathematics than do others in Latin American countries. You could imagine running summer schools or bringing kids for special training or sending teachers to other countries in the Spanish-speaking world, because Cuban pedagogy happens to be more effective. And that would help to pay for the school system. The fear for Cubans (and this isn’t unfounded) is that they’ll have to pay for these services that they have gotten for free. That would either be through increased taxes or copays – the kinds of things that are familiar in other healthcare systems. But those are systems that remain to be invented in Cuba, and any discussion about a privatization of either the schools or the healthcare system makes Cubans very anxious. Not a lot of things have worked well in Cuba, but these have. Cuba now exports healthcare personnel to Venezuela, it’s begun to export healthcare to Brazil, and they feel pretty good about this. It’s difficult to communicate to Cubans when you hear some of the hostile rhetoric coming out of the United States or part of Cuban-American Miami. I would say, relax Cuba has these assets. No one who wants to govern Cuba would want to destroy the assets you’ve built. But the financing of these activities would no doubt be reexamined. The Castro administration is reigniting talks with China over investments that fell through a few years ago. Why have those investments failed in the past, and what will Cuba have to change to be able to hold onto those? I think it’s ironic that one of the main advocates for market-oriented changes in Cuba is the Communist Party of China. The Chinese message to the Cubans is very simple: “Look, communist, single-party political regimes can survive and prosper provided you change how you run the economy.” And the Cubans are very slowly coming to understand this and do something about it, but they have lagged vastly behind China and Vietnam in this respect. One of the trends in trade between China and Cuba is that Cuba’s exports to China have been declining, whereas Cuba’s imports from China have remained very high. That means the Chinese are in effect financing a Cuban trade deficit. And that’s not a good starting point for a discussion about market-based investment relations. What do you think could bring them onto a more equal playing field? So what’s the risk of setting up a situation much like the inequality in the 1950s that led to the Cuban Revolution? The particular risk is less that, and more that it might end up like Chinese investments in Africa where the Chinese have gone without thinking through in sufficient detail about the social side effects of some of their investments, resulting in some nasty episodes. Cuba does have significant mining resources, principally nickel, some others as well, so that would be perfectly attractive for China. With Russia reopening one of its bases in Cuba, does it look like the shift toward a more open economy will lead them closer to China and Russia and further away from the United States? Having Cuba connect with China doesn’t necessarily move it further from the United States. The Chinese do say that U.S. policy should change and should remove all sanctions from Cuba, but they’re not trying to pick a fight with the U.S. The changes toward a more market-oriented Cuban economy actually go in the direction that Obama, Bush, and Clinton said they want. Putin has been pursuing for some time to reestablish Russia as a significant player worldwide, and that certainly takes him back to Cuba. The Cubans got one valuable thing out of it two years ago – the Russian government forgave the Cuban debt to the old Soviet Union that Russia had inherited. They didn’t forgive all of it, they forgave 90 percent, but that’s a huge amount of money. On a clearing-the-books basis, this was good for Cuba. Two footnotes to this: One is that Cuba will now have to start paying Russia something. Cuba hadn’t paid Russia a penny for the last 25 years, so they need to pay something on the remainder. The other footnote is that in order to pay something on the remaining 10 percent of the old Soviet debt, it assumes that the Russians and the Cubans will find economically productive activities to generate the revenue to pay for it, and they haven’t done it for 25 years. Unlike the Chinese, who have demonstrated that they can make the economy grow in a variety of sectors, the Russians have demonstrated they can only run one sector of their economy reasonably effectively and that’s petroleum and natural gas. Yes, they have been prospecting for petroleum and natural gas around Cuba, but Russian firms haven’t succeeded in finding meaningful quantities. So I’m a little skeptical that there can be enough economic activity between Russia and Cuba. The U.S. has tried to negotiate with Cuba to ease treatment of dissidents, but it seems Europe has been more successful in these attempts. What are we doing wrong? No one has been successful at this. The changes in relations between dissidents and the Cuban government for the most part have been almost wholly unaffected by international actors. In the release of some prisoners who wound up in Spain, the heavy lifting was done by the Roman Catholic Archbishop of Havana. We know about dissent coming from Cubans in the United States. What kind of dissent is there within the country? You don’t seem to hear about that often. It all depends on what the word “dissent” means. If by dissent one means people who are out on the streets demanding a change in the political regime, there’s a lot more than there used to be in the 1980s and 1970s, but there’s not a lot. If by dissent one means they disagree with the policies of the Cuban government on topic x, y, or z and are prepared to say so, that actually happens now with increasing regularity. On election day for the National Assembly, the number of candidates equals the number of posts to be chosen, so you’re not quaking if you’re a candidate. In any one district the party wants you to vote for everybody, but you actually have the option of voting for candidate A but not for candidate B. Candidate B will still be elected because the number of candidates equals the number of seats. But the proportion of votes that each would get would differ. So you’re not doing what the communist party wants you to do, and if voting blank or voiding your ballot, scribbling, you are also not voting the way the communist party wants you to. In the election a year ago, 24 percent of voters cast a non-conforming ballot. Are they dissenters? Well, not in the way the U.S. thinks of them, but yeah, they are indicating that they disagree with some important topic. So you do get an array of opinions and views and disagreement, people who criticize the slow pace of changing government policy. All of that is in the works, and there’s much more of it than before. Some have suggested the U.S. should shift away from a policy of regime change to one of reform and human rights. What kind of credibility does the U.S. have in doing this with Cuba? The U.S. government doesn’t have much credibility on topics of regime change, because the Cuban government thinks that the only policy our government is interested in is whether the Democrats or Republicans control the White House – effectively, to overthrow them. And if I were a Cuban official looking at Washington under Obama, Clinton, Bush, or Reagan, I would come to the same conclusion. Similarly, on the Straits of Florida, the two coast guards collaborate because Cuba doesn’t want the kind of massive undocumented immigration of the sort that brought down the East German communist government, and the U.S. doesn’t want massive undocumented entry from Cuba. If you think about that idea, it means the U.S. has a stake in the continuation of an authoritarian regime in Cuba, because no future Cuban political regime will have the will and the capacity to cooperate with the United States to prevent Cuban people from leaving. The Mexican government certainly doesn’t do it, and nobody else does it. It's high time that the American public loses it's ignorance over Cuba! 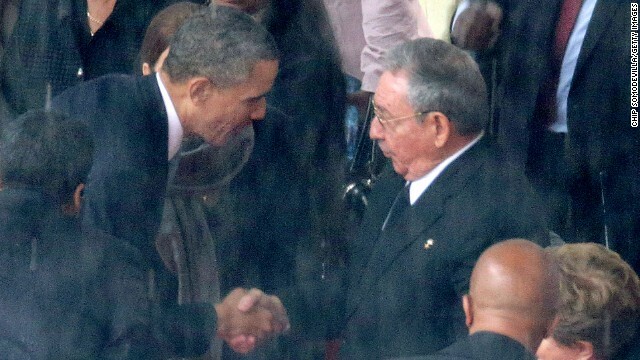 The Cuban leaders are very good people unlike the corrupt, self-serving, money-grubbing politicians in Washington!!! Amen @ George. And since there isnt a forum for what im about to say, i declare this an appropriate one! CAN WE SUE CONGRESS for NOT doing their job??? Here they are, about to go on a 5 week freaking vacation, from a job that they have been ON THE JOB VACATIONING for months...and the ONLY bill they are worried about passing, is sueing the POTUS for doing his job AND theirs too! What the he!! I view Cuba as a place that is changing slightly. When the economic system there has changed into a vital model of capitalism, I might want to go there and view it more closely. I do know some very nice Cubans here who fled their native land. Hey Joey, I went to Cuba six months ago and found it quite pleasant. Please, quit falling for all that right-wing and Mafia propaganda! Besides, had it not been for Communist government in Cuba, John Gotti would have died from cancer in a Havana suburb instead of a federal prison here! Ah, but, @ My Troll, I have a terrible habit: I think for myself. I'm glad that you had a good time in Cuba. A Cuban, a Ja pan ese guy, an American and a Mexican are in a boat. Lord forgive me and bless all the pygmies in New Guinea. Q. What is the Cuban national anthem? im a Cuban and I don't like tha estupec communist Government in cuba and I like to go back to live in my country if a can. If Americans are really free to travel to Cuba and both governments allow communications people to people then we can took about we are landing onto relations with Cuba. Cubans can start to see American people and money as key players. Now we don't have really nothing inside Cuba as Russians or China.. Embargo lacks Cubans Free Universal Health System from supplies from US the first biomedical potency worldwide. The same happens with Education. Both free system are in fact more successful than we have in United States. Cubans Health System covert everything for free, cancer, dentist, and for example pregnant woman worker have paid weeks before have the baby and later plus a license for one parent to care the baby without loosing job, rate and seniority. Coming from Cuba with my family to Miami I known from officials of the City the Cuban Education Board were three academicals level over Miami School Board..
Well put, napabuleici. It's to see someone like you tell it as it is instead of all idiots here parroting the view that both the U.S. government and the Mafia want us to see. Sorry for the misprint above. I meant, " It's great to see....", not, " It's to see.....". The one who's going to succeed Raul Castro might be the one to open up Cuba. Today the country is still ruled by the Castro clan. Once they're gone, Cuba will be able to reform. "rsene Wenger (1996-)Games 1,123Wins 642Draws 262Defeats 216Win rate 57%Empics Sports Photography Ltd."